Porcupine Basin is a narrow (200-300 km wide) V-shaped rifted basin located offshore SW Ireland, which formed during mid-to-late Jurassic rifting and shows increasing thinning factors from North to South. Thus, it is a perfect study area to learn about rifting processes as it allows us to get a full image of the thinned crustal structures using data acquired during only one cruise. Three ~300-km-long East-West profiles crossing the whole rift (P01/05, P02 and P03) at different degrees of thinning. One ~100-km-long profile oriented WSW-ENE (P06), focussing on the most stretched part of the basin. One ~250-km-long North-South profile (P04), which allows for the imaging of the central part of the basin, from almost un-stretched crust to highly stretched crust. 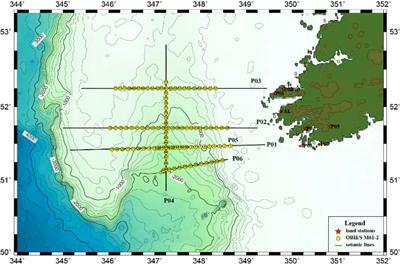 Each shot line was recorded by 12 to 32 ocean bottom instruments and up to 3 inline seismic land-stations. During this project, which started in September 2014, 1 PhD student (3 years) and 2 post-doctoral fellows (2 years) will process these data in order to build P-wave velocity models defining the deep-structures of this rifted basin. The data collected during the cruise are processed as receiver gathers. The different types of arrivals are then picked and used for building a P-wave velocity model that will allow us to define the geometry of the crustal structures along these profiles. Eventually, the use of S-wave arrivals together with P-wave arrivals will help defining the nature of the deep structures as the Porcupine Median High (volcanic? partially serpentinized mantle? continental crust?). This project is funded (or part-funded) by the Irish Shelf Petroleum Studies Group (ISPSG) of the Irish Petroleum Infrastructure Programme Group 4. The ISPSG comprises: Cairn Energy Plc, Chrysaor E&P Ireland Ltd, Chevron North Sea Limited, ENI Ireland BV, Europa Oil & Gas (Holdings) plc, ExxonMobil E&P Ireland (Offshore) Ltd., Kosmos Energy LLC, Maersk Oil North Sea UK Ltd, Petroleum Affairs Division of the Department of Communications, Energy and Natural Resources, Providence Resources plc, Repsol Exploración SA, San Leon Energy Plc, Serica Energy Plc, Shell E&P Ireland Ltd, Sosina Exploration Ltd, Statoil (UK) Ltd, Tullow Oil Plc and Woodside Energy (Ireland) Pty Ltd.
Manel Prada, Louise Watremez, Chen Chen, Brian O'Reilly, Tim Minshull, Tim Reston, Pat Shannon, Gerlind Wagner, Viola Gaw, Dirk Kläschen and Rose Edwards (2015). New constrains on the rifting evolution of the Porcupine Basin from wide-angle seismic data. European Geosciences Union General Assembly, Vienna, EGU2015-8934 (oral). Louise Watremez, Manel Prada, Tim Minshull, Brian O'Reilly, Chen Chen, Tim Reston, Gerlind Wagner, Viola Gaw, Dirk Kläschen and Patrick Shannon (2015). New insights of the nature of the Porcupine Median Ridge using Refraction Seismic Data. European Geosciences Union General Assembly, Vienna, EGU2015-7273 (poster). Louise Watremez, Chen Chen, Manel Prada, Tim Minshull, Brian O’Reilly, Tim Reston, Gerlind Wagner, Viola Gaw, Dirk Kläschen, Patrick Shannon and Rose Edwards (2015). Deep structure of the Porcupine Basin from seismic refraction data. Conference: From Hooke to Helioseismology, Leicester (poster). Manel Prada, Louise Watremez, Chen Chen, Brian O’Reilly, Tim Minshull, Tim Reston, Pat Shannon, Gerlind Wagner, Viola Gaw, Dirk Kläschen and Rose Edwards (2015). Wide-angle seismic data provides new insights on the crustal structure of the Porcupine Basin. 58th Irish Geological Research Meeting, Belfast (poster).